The history of Grover wines started as early as the 1960s with Kanwal Grover, a well established businessman in India who dealt in defence and technical equipments that he used to import from France, as part of his business. Through trips to France, he slowly developed a taste and passion for French gastronomy and wines. By enlisting professional help from a well-known expert, who later became a good friend and confidante, Georges Vessell of Champagne Mumm, the Grovers started out with planting vines on the Indian soil by importing the root stocks from Europe in particular from France, to turn their dream into reality. Michel Rolland, the highly reputed Bordeaux oenologist came on board in the mid 1990s when Georges retired, taking over the consultant’s role. From the first vines planted in 1988 till today there has been no looking back for the Grover family. The winery and vineyards that have grown exponentially, are now being run by Kapil Grover (son of Kanwal Grover) and the latest addition on board is the youngest winemaker of India, Karishma Grover, daughter of Kapil Grover, who is now in charge of the winemaking for the growing family business. She is a hard working professional who does not believe in resting on her familial laurels. She lives and works in India, in an ever-demanding environment and she means 'business' – for her its all about attaining “high quality” - quality right from the ‘grass root’ level. Despite being under the weather and having completed a very full on travel and work schedule, she displayed utmost warmth and kindness, welcoming me with lovely messages as soon as I turned on my phone, on landing into Chhatrapati Shivaji Mumbai airport. She is committed and determined to turnaround the Indian wine industry, the outdated perceptions associated with it and she is prepared to work hard for it. Following are excerpts from my interview and talks with Karishma during my recent visit to India. Sumilier: Please share your background in wines and where you got your training in winemaking from. Karishma : I did my undergraduate degree in Viticulture and Oenology from 2003 to 2007 from the University of California, Davis. After this I did a harvest internship in Napa Valley, and then came back to India to join Grover Zampa. I have been here since 2008, a whole of 9 years now! Sumilier : India’s climate is very different from the rest of the world. How have you modified your wine making styles to suit the Indian conditions? Karishma : The major challenge for viticulture is monsoon in India. There isn't really a major grape growing region in the world where you have a period of incessant rains in such exceedingly high quantity as we get, combined with the warm and sometimes even harsh temperatures that the subcontinent faces. We also have two growing seasons, as there is a lack of dormancy- so the vines get tired sooner. So we have made major adjustments to our viticultural styles, changed the pruning times to prune earlier and using different irrigation and fertilization protocols we aim to minimize the effect of these climatic conditions on the wine quality. We are also using varieties that are more resistant to warm temperatures. The Indian consumer is not as mature as that in the west, however, there is a huge uptake and interest to learn more. Our approach is to create approachable but international quality wines. Sumilier : What changes have you noticed in the consumer preferences in India over the last 10 years. And where do you see the Indian market moving towards? Karishma : The Indian consumer has always had a preference for red wine, and the market has always had a big tilt towards heavy reds since the beginning. However, I am finding that this is becoming more pronounced now. Equally people are opening up into exploring wines much more than before so there is a change in trend for sure. Accompanied with this, there is also more confidence and consistency in terms of delivery for Indian wines, and so we are able to push more towards quality whilst commanding equally competitive prices for Indian wines- this I observe across all brands in India. Sumilier : Your most memorable achievement that you makes you special. Karishma : Our 2014 Art Collection Sauvignon blanc won the International Trophy at the Decanter Asia Awards. This is India's first such medal and remains a proud moment for all of us. Sumilier : How did you narrow down on the regions where you grow grapes in India and which of the Grover/ Grover Zampa’s flagship wine blends / varietals are your personal favourites. 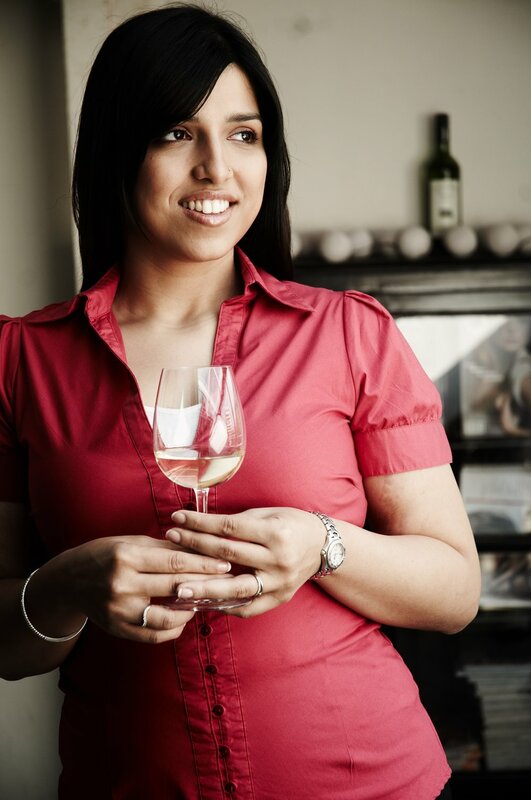 Karishma : We did 8 years of experiments with 33 different varietals across various grape growing regions in India, invited interns to come to make the wine and performed tastings from wines made from each of the location to choose the best. Finally in 2002, we came out with our first vintage and in October we celebrated our 25th anniversary! I think our portfolio is incredible. We are more prevalent in terms of vineyard and production size on the Bangalore side (Nandi Hills) although our Nasik region is equally producing some outstanding wines. Honestly speaking, it is extremely difficult for me to choose a favourite! I love drinking Grover Zampa wines and am extremely proud of the range we have at the moment. Sumilier : How has the year 2017 been so far? 2017 has been a very strange year as the vineyards have suffered unusually long rains, which have gone as far as October end (usually the rains top by September), due to the North Eastern rain rain clouds taking on an unusual pattern. But having weathered the droughts of 2016 and 2015, I am optimistic that things will eventually stabilise as the growing period takes shape and by December we expect the best of the season to bring in cool temperate climate which will help turn around the vines. Sumilier : Who is your role model in this industry? Karishma : When I started in India in this industry, there were not many people in the industry, definitely no women winemakers. I see small changes now happening, but I really wish I had a role model in India, before I got on with wine making. Coming from California, where a large chunk of the winemakers are women. I am hopeful we can have that in India in the next few years. Outside India it will have to be Michel Rolland, who inspired me to join the industry. Sumilier : Where do you see yourself 20 years from now? Karishma : Me personally? (Smiling!) I hope to still be making wine, and continue to represent a high quality of Indian wine internationally! Sumilier : Your favourite wine to relax for the weekend? Sumilier : What would you have been doing if not in wine today? Sumilier : Do you see women players in the industry especially in india? As a role model for future younger women, what message would you like to pass on to them to inspire them into this profession. Karishma : I think that women in India in all professions really need a boost. This one is a tough profession specifically, and I would tell anyone who is interested in wine- that passion is key and education is important. For women in particular my message is - don't let anyone define your life. If wine is a passion for you, then please definitely pursue it! And I am happy to take on determined women wine professionals who have the aptitude!